Business visa is an authorization of the designated country/countries of destination within the Schengen Area issued to the citizens of countries that have mandatory visa requirements from the Schengen Zone with the sole purpose of doing business in the Schengen zone. The holder of this type of visa is not required to have the citizenship of the designated country in order to follow their business agenda yet it such an authorization has its limitations as well. What Documents are Required When Applying for a Business Schengen Visa? Two recently taken photos must be attached. Both photos must be taken within the last three months, according to the Schengen visa photo requirements. A valid passport. It should valid for at least three more months beyond the date you plan to leave Schengen area. Older passports with visas on them (if you have any). Round trip reservation or itinerary It must include dates and flight numbers specifying entry and exit from the Schengen area. You can use the visa consultation services like this one. These guys can handle most of your business visa mandatory requirements such as flight itineraries, hotel reservations along with free consultation over email. Proof of accommodation. A document that shows where you will be accommodated throughout your stay in Schengen. This could be a hotel booking, a rental agreement, or a letter of invitation from a host at whose house you will be staying. Bank account statement – that shows you have enough money in your account for the trip. The statement shall be no older than 3 months. Sponsorship Letter – by another person that confirms they will be financially supporting your trip to the Schengen. In order for this letter to be valid, it must be accompanied by a bank statement of the sponsor, no older than three months. A combination of your bank account statement and a letter of sponsorship. Cover letter. Explaining the purpose of the visit to the Schengen country. A short profile of the applicants working place. Letter from employer. Meticulously describing the purpose of the travel as well as the itinerary of the days spend within the Schengen zone. Invitation letter. Written by the partner company in the Schengen zone, faxed also to the corresponding consulate. This letter has to appear as an invitation to attend meetings or other relevant events matching trade, industry or work. Proof of financial means. It must be stated either in the employer’s letter or the partner company’s invitation that one of both parties will be covering the applicant’s travel expenses during his/her stay in the Schengen Zone. Where to Submit the Business Schengen Visa Application? You have to submit your application for a Business Schengen Visa to the consulate or embassy of the country where you will be entering or residing the most during your business trip. If you are planning to visit only one country – then you need to apply at the embassy / consulate / visa center of the country you will be visiting. If you are planning to visit more than one country – then where you need to apply depends on the number of days you will be spending in each of the countries you will step in. When spending equal amount of days in each – then you need to apply at the embassy / consulate / visa center of the country where you will arrive first. When spending unequal amount of days in each – then you will need to apply at the embassy / consulate / visa center of the country where you will be spending more time. How to Apply for a Business Schengen Visa? Check at which Embassy/Consulate you need to apply. In order to file your business visa application at the right place, you will need to know which country should issue you a business visa (if you are planning to visit more than one Schengen state). Then you need to check, what body of that particular country handles visa applications or whether it has outsourced visa submission to another party. Schedule an appointment at the embassy / consulate / visa center. Attend the visa interview. Take all of the required documents for business visa with you. Wait for a response. In the meantime, the embassy will process your visa, which will go through EU security systems as Visa Information System and Schengen Information System. When to Apply for a Business Schengen Visa? The earliest time to apply for a Business visa is three months before your planned trip and the latest is at most 15 working days before your intend to travel to Europe for business purposes. The best time to apply for a Business Schengen visa is at least three weeks before your business trip to Europe. How Long is the Business Schengen Visa valid for? Business visa is commonly valid for stays no more than 90 days. If you will be traveling a lot and not only in one Schengen country it’s recommendable to fill in the “multiple entry” gap in the application form. This way you will be able to enter and leave Schengen Zone as you please for the amount of time allowed on your visa issued. Please, make sure to understand carefully the labels attached to the business visa sticker, including the period it permits you to remain in Europe, otherwise, there can be consequences to overstaying Business Schengen visa. How Long Does it Take to Get a Business Schengen Visa? On average, the processing time for a Business Schengen visa is 10 business days. Within this period, the applicant will be informed whether the Business Schengen visa has been granted or rejected. However, depending on the situation, processing time for a Business visa to Europe might take up longer if there is something extraordinary with the individual case or any political situation is on the go. The Schengen Agreement signed on June 14, 1985, is a treaty that led most of the European countries towards abolishment of their national borders, to build a Europe without borders known as “Schengen Area”. Signed in Luxemburg, initially by only five EU countries, the agreement remains one of the world’s biggest areas that have ended border control between member countries. The concept for free movement between the European countries is very old and it can be found through the middle ages. Whereas, in modern times this idea was discoursed ever since Europe suffered detriment resulted from the 2nd World War. However, concrete actions in this regard only took place during 80s, as the Europe was stuck inside an everlasting debate of two opposing fragments: the one that was supporting the idea of free Europe with no internal border checks amongst countries, and the other part that was absolutely against it. France and Germany are the two pioneering countries to take initial step as regards of free movement concept, steps that were even more concrete, as they commonly agreed to move this over-debated concept into a next level. These two countries on 17 June 1984 were the first ones to bring out the abovementioned topic within the framework of the European Council in Fontainebleau where they all approved to define required conditions for the free movement of citizens. As a final point of this journey, what it came to be “The Schengen Agreement” – covering the gradual abolishment of the internal borders between countries and an extended control of the external borders, was only signed on 14 June 1985. The Agreement was signed by the five (5) following European countries: France, Germany, Belgium, Luxemburg, and Netherlands, in Schengen, a small village in Southern Luxemburg on the river Moselle. 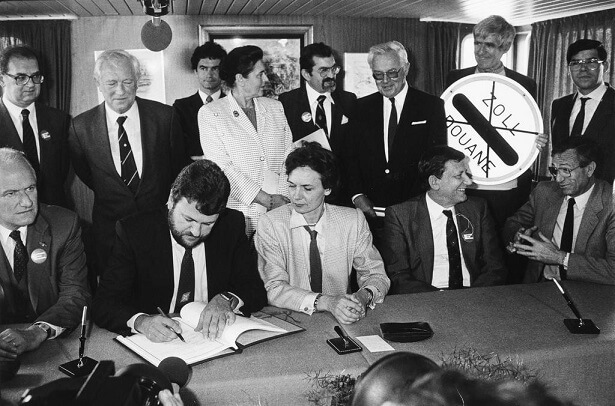 14 June 1985 – signing the Schengen Agreement: Catherine Lalumière (France), Waldemar Schreckenberger (Germany), Paul De Keersmaeker (Belgium), Robert Goebbels (Luxemburg) & Wim van Eekelen (Netherland). Five years later, on 19 June 1990, a Convention was signed for the concrete implementation of the Schengen Agreement. This convention covered issues on abolition of internal border controls, definition of procedures for issuing a uniform visa, operation of a single database for all members known as SIS – Schengen Information System as well as the establishment of a cooperating structure between internal and immigration officers. This way, Schengen Area concept experienced an incessant expansion, as on 27 November 1990 Italy, on 25 June 1991 Portugal and Spain and on 6 November 1992 Greece joined. Despite that Schengen Agreement – including treaties and rules were established, the real implementation of the Schengen Area finally started on 26 March 1995, where seven Schengen member countries: France, Germany, Belgium, Luxemburg, Netherlands, Portugal, and Spain decided to abolish their internal border checks. Since then, the Schengen Area breathed a fast developing and expanding trend. Thus, on 28 April 1995 Austria, on 19 December 1996 Denmark, Finland, Iceland, Norway, and Sweden were new five countries to join. On the other hand, led by sample of seven aforementioned countries, in October Italy and in December 1997 Austria abolished their internal border controls. Another major progress shown by the Schengen Agreement was when in May 1999 “The Treaty of Amsterdam” incorporated the agreement inside the legal framework of the European Union, as in the past the Schengen treaties and rules set by the agreement were not part of the European Union and were operating autonomously. The enlargement of the Schengen Area continued its prosperous journey as in January 2000 Greece and March 2001 Denmark, Finland, Sweden, Iceland, Norway, on 16 April 2003 Czech Republic, Estonia, Hungary, Latvia, Lithuania, Malta, Poland, Slovakia and Slovenia and in October 2004 Switzerland were the new fifteen countries (15) that joined. This successful story did not end there, as in December 2007 the same nations declared the abolishment of their land and sea, and in March 2008 of the airport border controls. In February 2008, Liechtenstein was the 26th and the last country so far to sign the Schengen Agreement and become part of the Schengen Area. In December 2008, Switzerland abolished land and in March 2009, the airport border controls. The latest important event towards the implementation of the Schengen Agreement was in December 2011 when after three years of signing the Schengen Agreement Liechtenstein declared its internal border control abolishment. Being a member state of the European Union (EU) is not unquestionably associated with a membership into the Schengen Area, even though this, legally, is an unavoidable step. The majority of the following EU member countries have been prone of the unresolved political issues that have left these countries outside of the Schengen Agreement. Such is the case of Cyprus – a member of the EU since 2004 but yet not a member state of the Schengen Area, thus it cannot sign the Schengen Agreement until it resolves its dispute as a de facto divided island and related political problems. The Sovereign Base Areas of Akrotiri and Dhekelia that are outside of the EU will also need other handling and mechanisms until they can join the area. Just the same, Bulgaria and Romania are the following two (2) members of the EU since 2007 that are not members of the Schengen Area or did not yet signed the Schengen Agreement. These countries submitted their wish to become members of this area, which was approved by the European Parliament in June 2011 but this request was rejected by the Council of Ministers in September 2011, as Finland and Germany expressed their worries regarding lack of these countries to enforce mechanisms for fighting corruption and criminality, as well as regarding the illegal entries of Turkish people from these countries towards the Schengen Area. Croatia is the next country in the list of potential Schengen Area members to sign the Schengen Agreement. Even that it has joined the EU on 1 July 2013, the country has not yet became a member of the area. The country as of March 2015 has expressed its readiness to become member, and is undergoing a technical evaluation that has started on 1 July 2015 and is expected to end by July 2016. On the other hand, the illegal entries from the 2015 influx of migrations that came from Greece through Macedonia and Serbia to Croatia heading for Slovenia, Austria, and Hungary as Schengen member countries has grew many questions about the sustainability of the area and especially its further enlargement in this situation. Moreover, since the country was dealing with lots of illegal entries from the Croatian border, Hungary stated that it could be the one to vote against the accession of the Croatia in Schengen Area. Apart from the Azores, Madeira and the Canary Islands, no other country that is located outside of the European continent is not part of the Schengen Area or have not signed the Schengen Agreement. Accordingly, the following six integral parts of the France located outside the Europe: French Guiana, Guadeloupe, Martinique, Mayotte, Réunion, and Collectivity of Saint Martin are members of the EU but are not of the Schengen Area, and therefore even the Schengen visa issued by France is not valid in these territories. Each of these territories has its own visa policies and regimes for nonmembers of the European Economic Area and non-nationals of Switzerland. These following four territories are also other integral territories of France, located also outside of the European territories that are not members of the EU or Schengen Area: French Polynesia, French Southern and Antarctic Lands, Caledonia, Saint, and Wallis and Futuna. These following six territories are integral parts of Netherland in Caribbean: Bonaire, Sint Eustatius, and Saba (BES Islands) and Aruba, Curaçao, and Sint Maarten (independent countries of the Kingdom of Netherlands). None of these territories is not part of the EU nor of the Schengen Area, and they have their own visa policy and regime. The two following territories are an integral part of the Denmark: Faroe Islands and Greenland. Despite this, none of them is a member of the EU or of the Schengen Area. As a result, holders of Denmark visas cannot enter any of these two territories if they first do not get visas specifically from such countries. However, nationals of Nordic Passport Union member countries can enter these two territories only through Identification cards. Schengen Area, signifies a zone where 26 European countries, abolished their internal borders, for the free and unrestricted movement of people, in harmony with common rules for controlling external borders and fighting criminality by strengthening the common judicial system and police cooperation. Schengen Area covers most of the EU countries, except the UK, Ireland and the countries that are soon to be part of: Romania, Bulgaria, Croatia and Cyprus. Although not members of the EU, countries like: Norway, Iceland, Switzerland and Lichtenstein are also part of the Schengen zone. Four of them – members of the EFTA, implement Schengen Aquis through Specific Agreements related to the Schengen Agreement. Iceland, Norway, Switzerland and Lichtenstein are associate members of the Schengen Area but are not members of the EU. Monaco, San Marino, and Vatican City have opened their borders with, but are not members of the visa free zone. The Azores, Madeira, and the Canary Islands are special members of the EU and part of the Schengen Zone even that they are located outside the European continent. There are six more EU members, that have not joined Schengen zone: Ireland and United Kingdom – that still maintain opt-outs and Romania, Bulgaria, Croatia, and Cyprus – that are required to and are seeking to join soon. The external borders of the Schengen Zone reach a distance of 50,000 km long, where 80% of it is comprised of water and 20% of land. The area counts hundreds of airports and maritime ports, many land crossing points, an area of 4,312,099 million km2, and a population of 419,392,429 million citizens. Note: Although most of the Schengen countries are in the European Union, you should not confuse the Schengen Area with the EU. One of the richest countries in the world by per capita GDP terms, Austria, has an area of 83,871km2, and is inhabited by 8,712,137 residents. The country signed the Schengen agreement on 28 April 1995. However, it started its implementation more than two years later on 1 December 1997. Austria is located in the central Europe, and is bordered by 8 countries, more than most of the other European countries. Its capital, Vienna, remains one of the top European destinations for travelers. In 2017 alone, the Austrian embassies around the world received a number of 304,556 visa applications. Belgium is one of the five first countries that signed the Schengen agreement on 14 June 1985, and started its implementation on 26 March 1995. It is a small and densely populated country, with an area of 30,528km2 and a number of 11,358,379 residents. Located in Western Europe the country is bordered by France, the Netherlands, Germany and Luxembourg. Its capital, Brussels, is the administrative center of the European Union, which is often referred to as the EU’s capital city. A number of 231,437 travelers from all around the world applied for a visa to Belgium in 2017. Shortly known as Czechia, the country was founded as late as in 1993, with the peaceful dissolution of Czechoslovakia. The central European country has an area of 78,866km2 and is bordered by Germany to the west, Austria to the south, Slovakia to the east and Poland to the northeast. It has a population of 10,610,947, 64.3% of which are Czechs while the rest are Slovaks, Moravians, Ukrainians and others. The country has a considerable income from tourism, with Prague listed as the fifth most visited city located in the old continent. The Czech Republic signed the Schengen agreement on 16 April 2003 and started its implementation years later, on 21 December 2007. Last year, 623,255 foreigners in need of a visa, applied for one at the Czech embassies around the world. Denmark is the southernmost country of the Scandinavian countries. It has an area of 43,094 km2 and is located in the south-west of Sweden and south of Norway. Whereas, to the south it is bordered by Germany. The Danish government signed the Schengen agreement in 19 December 1996 and started its implementation on 25 March 2001. However, Denmark is currently one of the six Schengen countries with reintroduced border checks due to the security situation in Europe and threats resulting from the continuous significant secondary movements. The Nordic country has a population of 5,785,864 residents who have one of the highest standards of living, not only in Europe, but in the whole world as well. In 2017, it received 152,467 visa applications. Figures show that Denmark has received 1 million more tourists in 2017, in comparison to 2014. The northern European Republic of Estonia is bordered to the west by the Baltic Sea, to the south by Latvia, to the north by the Gulf of Finland and to the east by Lake Peipus and Russia. With an area of 45,338 km2 and 1,312,442 residents, it is one of Europe’s least crowded countries. This flatland country also consists of 2,222 islands and islets in the Baltic Sea. Throughout the centuries, the territorial area of today’s Estonia has been ruled by the Danish, the Swedish and recently by the Soviet Union. Its government signed the Schengen agreement on 16 April 2003 and started its implementation on 21 December 2007. In 2017, the country received 138,249 visa applications. However, figures show that 3.54 million foreigners stayed overnight in Estonia, 6.6% more than in the previous year. Officially known as the Republic of Finland, the Nordic country is bordered by Norway to the north, Sweden to the northwest, and Russia to the east. It is famous for its educational system, and for being one of the safest and most eco-friendly countries on earth. Its 5,503,132 residents populate the happiest country in the world. Finland has an area of 338,145 km2. It signed the Schengen agreement on 19 December 1996 and started its implementation on 25 March 2001. It remains one of the most visited Schengen countries, since last year alone it received 827,520 visa applications. Statistics show that out of around 3,1 million tourists that entered Finland in 2017, 1,5 million of them were from the EU states. The most visited country in Europe, France, is not all about the Eiffel Tower. Known for its fine wine, sheer diversity, heritage sites and luxury skiing resorts, the country lured 85.7 million foreign tourists in 2013, the highest number ever. The 551,695km2 country borders eight European countries: Belgium and Luxembourg in the northeast, Germany and Switzerland in the east, Italy and Monaco in the southeast, and Andorra and Spain in the south and southwest. It is home to 64,720,690 residents, who can move freely within the Schengen Area, since the country is one of the five founding countries of the Schengen Zone on 14 June 1985. The implementation of the agreement in France started on 26 March 1995. The land of invention and innovation and the second most visited Schengen country, Germany, consists of an area of 357,386km2 and 16 constituent states. The most populous EU member is also the European country that borders most other countries. It is located in Western and Central Europe, with Denmark bordering to the north, Poland and the Czech Republic to the east. It has Austria to the southeast, Switzerland to the south-southwest, France, Luxembourg and Belgium lie to the west, and the Netherlands to the northwest. The German passport is amongst the top three most powerful passports in the world, since its 81,914,672 residents can visit 188 countries visa-free. Germany is one of the five founding countries of the Schengen agreement, signed on 14 June 1985. It started its implementation year later on 26 March 1995. The cradle of Western civilization, Greece, is located at the crossroads of Europe, Asia, and Africa. The Hellenic Republic is considered as the birthplace of democracy, western literature, historiography, political science, Olympic games, etc. Despite of the fact the its borders have changed throughout the year, today Greece shares land borders with Albania to the northwest, the Republic of Macedonia and Bulgaria to the north, and Turkey to the northeast. Despite that Greece signed the Schengen agreement on 6 November 1992 and started its implementation on 1 January 2000, none of its neighbors has joined the area yet. The country has an area of 131,990 km2 and 11,183,716 residents. Greece has a unique cultural heritage, beautiful island and beaches, what makes it a favorite destination for many travelers. In 2017, it received 1,029,564 visa applications from travelers worldwide, what makes it the fifth Schengen country with most applications received. Located in Central Europe, Hungary has an area of 93,030 km2 and is home to 9,753,281 residents. It shares land border with Slovakia to the north, Ukraine to the northeast, Austria to the northwest, Romania to the east, Serbia to the south, Croatia to the southwest, and Slovenia to the west. A high number of travelers visit the country each year. In 2017, it received 263,940 visa applications. When it comes to tourism, Hungary is one of the main medical tourism destinations in Europe. In dental tourism alone, it has a share of 42% in Europe and 21% worldwide. It signed the Schengen agreement on 16 April 2003 and started its implementation on 21 December 2007. The Nordic island country is located in the North Atlantic and is volcanically and geologically active. It has a population of 348,580, two-thirds of which reside in the capital of Reykjavik and the surrounding area. The country has an area of 103,000 km2. Ecotourism and whale-watching are amongst the top tourism attractions in Iceland. However, in 2017, the country received 7,610 visa applications, least among all other states. It first signed the Schengen agreement on 19 December 1996. It signed a second agreement, which replaced the first, on 18 May 1999 following the incorporation of the agreement into EU law with the Treaty of Amsterdam. Iceland finally started the implementation of the agreement on 25 March 2001. The sovereign state of the Italian Republic is located in the heart of the Mediterranean Sea. It has an area of 301,318 km2and is bordered by France, Switzerland, Austria, Slovenia, San Marino, and Vatican City. With 59,429,938 residents, it is the fourth most populous EU member. Italy is the successor of what was known as the enormous Roman Empire, that left behind a rich history and a lot of cultural attractions, what have affected Italy to become one of the top destinations in Europe. Italy is also the country that gave to the world some of the most famous scholars, artists and polymaths as Michelangelo, Leonardo da Vinci, Raphael, Galileo and Machiavelli. It started the implementation of the Schengen agreement on 26 October 1997 after having signed it previously on 27 November 1990. In 2017, it was the third Schengen state with most visa applications received (1,850,260). The Republic of Latvia shares borders with Estonia in the northern region, Lithuania in the southern, to the east is Russia, and Belarus to the southeast. The 64,589km2 country has a population of 1,970,530 inhabitants. Latvia is currently a member of the European Union, NATO, the Council of Europe, the United Nations, CBSS, the IMF, NB8, NIB, OECD, OSCE, and WTO. It signed the Schengen agreement on 16 April 2003, and started its implementation on 21 December 2007, thus becoming part of the European borderless territory. Its capital, Riga is known for its architecture, multicultural heritage, and the Old Town, which is a UNESCO World Heritage Site. Riga was named the European Capital of Culture for 2014. Principality of Liechtenstein is a doubly landlocked German-speaking microstate in Central Europe. It has an area of only 160 km2 and 37,666 residents, what makes it the fourth smallest European country. Liechtenstein shares borders with Switzerland to the west and south, and Austria to the east and north. The country is mainly mountainous, thus an alluring winter sport destination. It is the last country that joined the border-free Schengen area, after it signed the agreement in 28 February 2008 and started its implementation on 19 December 2011. The 65,300km2 country is bordered by Latvia to the north, Belarus to the east and south, Poland to the south, and Kaliningrad Oblast (a Russian exclave) to the southwest. It has a population of 2,908,249 residents, and uses euro as its currency. Lithuanian is one of the oldest languages in the world today. And along with Latvian, it is also one of only two living languages in the Baltic branch of the Indo-European language family. Lithuania signed the Schengen agreement on 16 April 2003 and started its implementation later on 21 December 2007. In 2017, Lithuania received 413,966 visa applications, which is more than countries like Austria, Portugal, Sweden, Denmark, or Norway. There are three UNESCO World Heritage Sites in Lithuania. Luxembourg is a country of 2,586 km2 and has a population of 575,747 residents. It is one of the founding states of the Schengen agreement, which was signed in 14 June 1985 in the village of Schengen in Luxembourg. Its capital, Luxembourg City, is one of the three official capitals of the European Union. Ranked by its GDP, Luxembourg is the second richest country in the world. It has the highest minimum wage in the EU while also being one of the safest countries in the world. The motto of the country is ‘mir wëllebleiwewatmirsinn’, which means ‘we want to remain what we are’. The Southern European island country consists of an archipelago in the Mediterranean Sea, with an area of 316 km2 and a population of 429,362 residents. Despite of its small area, the country received a number of 37,881 visa applications is 2017. In tourism terms, it is mostly known for its sun, sea and beaches. Some of its most alluring destinations for travelers are also ancient wonders as the 5,000 years old Hagar Qim or the 4,000 years old Hal Saflieni Hypogeum. Malta signed the Agreement on 16 April 2003 and started its implementation on 21 December 2007. Mostly known for the colorful tulips, numerous windmills and delicious cheese, the Netherlands consists of twelve provinces. The country borders Germany to the east, Belgium to the south, and the North Sea to the northwest. It has an area of 41,526 km2 and 16,987,330 residents. It is a founding member of the EU, Eurozone, G10, NATO, OECD, and WTO. Moreover, it is one of the five founding states of the Schengen agreement, signed on 14 June 1985. The largest port in Europe and world’s largest port outside Asia, the Port of Rotterdam, is located in the Netherlands. This Western European country has the highest English-proficiency in the world and it is the world’s second biggest beer exporter, after Mexico. The land of the midnight sun, Norway, has an area of 385,155 km2. It has a population of 5,254,694 residents known as Norwegians. It is bordered by Finland and Russia to the northeast, and the Skagerrak strait to the south, with Denmark on the other side. The country attracts visitors mainly because of its stunning fjords and its Viking heritage. In 2017, the Norwegian embassies around the world received 196,082 visa applications. Norway signed the Schengen agreement on 19 December 1996. A second agreement, which replaced the first, was signed on 18 May 1999 following the incorporation of the agreement into EU law with the Treaty of Amsterdam. Norway started the implementation of the agreement on 25 March 2001. It is known as the land of the midnight sun because certain areas of the country get 24 hours of sunlight for part of the summer. Poland is an EU country located in the Central Europe. It is divided in 16 administrative subdivisions and has an area of 312,683 km2. Home to 38,224,410 residents, the country shares border land with Germany, Russia, Lithuania, Ukraine, Slovakia, the Czech Republic, and Belarus. Its most famous and visited cities are Warsaw, the medieval town of Malbork, Lublin, Torun, Krakow and Poznan. Poland is also known for the Tatra National Park and the Bialowieza Forest. Figures show that most of visitors are from Germany, followed by Britons and Russians. In 2017, Poland received 823,101 visa applications, what makes it the seventh country with most applications received. The country signed the agreement on 16 April 2003 and started its implementation in the late 2007. The westernmost European country, Portugal, shares borderland only with Spain, to the north and east. It has an area of 92,391 km2 and 10,371,627 residents. It is the oldest state on the Iberian Peninsula and one of the oldest in Europe. Known for football, beautiful beaches and historic sites, the country manages to allure many visitors throughout the whole year. Most visited Portuguese spots are the capital of Lisbon, the subtropical island of Madeira, the second largest city – Porto, the small fishing village of Ericeira, and Óbidos – which is known for its many medieval castles. Portugal signed the Schengen agreement alongside with its only neighbor Spain, on 25 June 1991 and started its implementation on 26 March 1995. A landlocked country in Central Europe, Slovakia has a territory of 49,037km2. Its 5,444,218 residents are known as Slovak who speak the Slovak language. The country shares borders in the north with Poland, Ukraine to the east, the Czech Republic to the west, Hungary to the south, and Austria to the southwest. Slovakia became an independent country after the peaceful dissolution of Czechoslovakia on 1 January 1993. Ten years later, on 16 April 2003 it signed the Schengen agreement. On 21 December 2007, it started the execution of this convention. Slovakia has world’s highest number of castles and chateaux per capita. The Spiš Castle, which is part of the UNESCO List of World’s Cultural and Natural Heritage, is one of the most famous. After Liechtenstein, Luxembourg and Malta, Slovenia is the smallest Schengen state. The country joined the Schengen Area on 16 April 2003, and started the full implementation of the convention four years later on 21 December 2007. Slovenia is known for the scenic Lake Bled, the Postojna Cave, Triglav National Park and its many castles. In 2017, Slovenian embassies and consulates around the world received 29,257 visa applications. Spain has an area of 510,000 km2 and shares land borders in the north and northeast with France, Andorra, and the Bay of Biscay; and to the west and northwest with Portugal. It is the second largest country in the EU bloc with a population of 46,347,576 residents. The Spanish cities, Madrid and Barcelona, are some of the cities that allure most foreign visitors in Europe. Bullfights, La Tomatina festival and Ibiza’s Parties are among the best-known and attended events in Spain. Spain signed the agreement alongside with Portugal, on 25 June 1991 and both of them started its implementation on 26 March 1995. Sweden is a Scandinavian country located in Northern Europe. It has an area of 449,964 km2 and shares land borders with Norway and Finland. The country connects with Denmark by a bridge-tunnel across the Öresund, a strait at the Swedish-Danish border. Its 9,837,533 residents are known as Swedish or Swedes. Sweden signed the agreement in 09 December 1996 and started implementing it later on 25 March 2001. In 2017, Swedish embassies around the world received and processed 248,347 visa applications. The non-EU country, Switzerland, became part of the Schengen area after it signed the agreement on 26 October 2004 and started its implementation on 12 December 2008. The country is landlocked between Italy to the south, France to the west, Germany to the north, and Austria and Liechtenstein to the east. It has an area of 41,285 km and four national languages: French, German, Italian and Romansh. Switzerland has one of the most powerful European economies and its 8,401,739 citizens have one of the highest living standards in the world. In 2017, Switzerland received 517,010 visa applications. This makes it the tenth Schengen state with most applications received, despite of having a smaller territory than most of the other member states. *Note: Before joining the visa free Area, the aspirant country is prone to a Schengen Evaluation. Afterwards, a member country undergoes a periodical evaluation to ensure the appropriate application of Schengen Acquis. The European countries that are not part of the Schengen zone are: Albania, Andora, Armenia, Azerbaijan, Belarus, Bosnia & Herzegovina, Croatia, Cyprus, Georgia, Ireland, Kosovo, Macedonia, Moldova, Monaco, Montenegro, Romania, Russia, San Marino, Serbia, Turkey, Ukraine, The United Kingdom and Vatican City. No. United Kingdom is not part of the Schengen zone and therefore you are not allowed to enter the UK with a Schengen visa. UK residents might need to apply for Schengen visa if they want to travel from the UK to other countries in the EU. The Schengen Borders Agreement permits people to travel freely within the area, if the traveler otherwise qualifies to enter the Schengen Zone, by crossing an official external border during regular hours of operation and obtaining an entry stamp in the passport. Am I able to travel within the Schengen Area with the residency permit? The residency permit is allows you to freely travel throughout the whole Schengen Area, without any additional documents needed. The residency permit is stamped in your passport. However, you have to notify the authorities if you intend to make trips in and out of the Schengen space. Can I travel to more than one member country with the same Schengen visa? Yes, once you are issued the visa you can travel within the Schengen Zone as long as you don’t exceed the timeframe granted your visa.